My dear friend Jean Groen invited me for a visit in Arizona in January, to do programs on native foods at the Hassayampa River Preserve near Wickenburg and the Casa Grande National Monument near Coolidge. I had never been to either site, so I was excited about the opportunity. 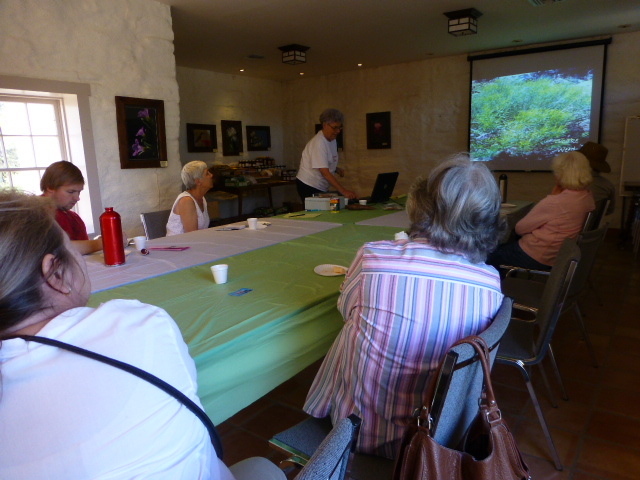 Even more exciting was spending time with Jean and seeing how she makes preserves, mesquite flour and many delicious treats from other native plants. Jean is 80 years young and round circles around me! 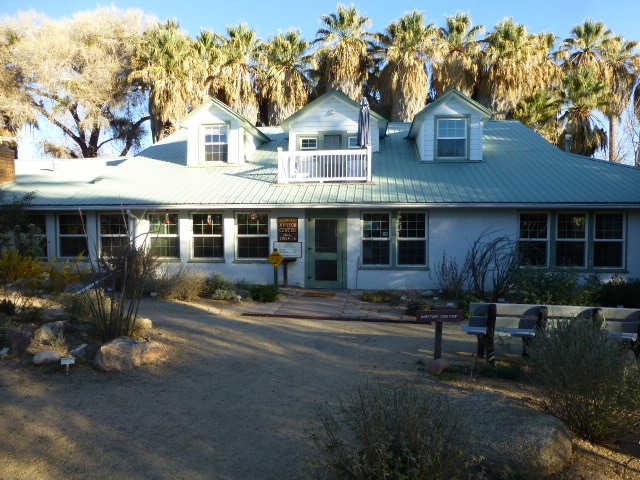 Headquarters at Hassayampa River Preserve, a former ranch house build in the late 1800s. 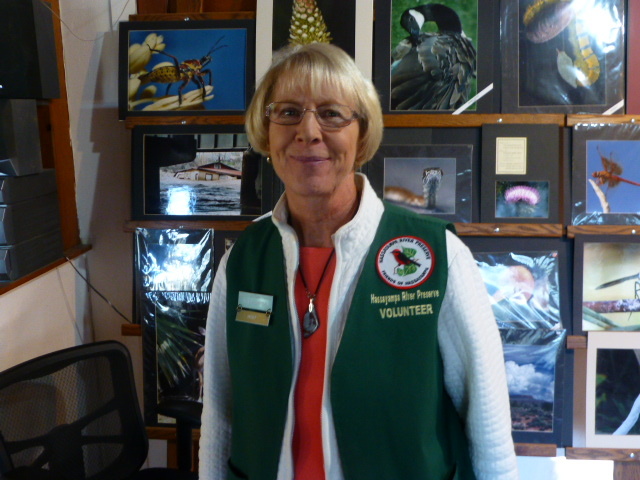 One of the helpful volunteers let me take her picture so I could remember how to spell Hassayampa. It is the name of a river and has been used as the name of a couple of resorts, golf courses and at least one hotel in Arizona. 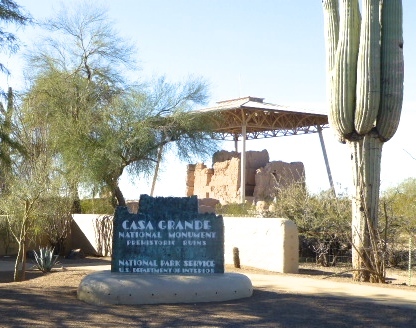 The Casa Grande or Big House is a three story structure made of a caliche-based brick and mortar. It is protected from the elements by a modern metal canopy. It was the center of a community of smaller structures hundreds of years ago. 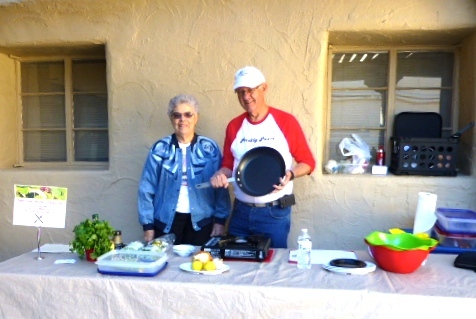 Inside the park compound, Jean and Jim prepare for a cactus cooking demonstration for park visitors. The trip was a fun break in routine for us. We shared techniques and recipes and had a great time. I think Jean will be cooking cactus the “Gringo Gourmet Way” now and will not be using jarred cactus from the grocery store! Jean has authored seven books and makes it look easy. She has inspired me to maybe give it a try one day! I’m looking forward to more good times with Jean in the future. 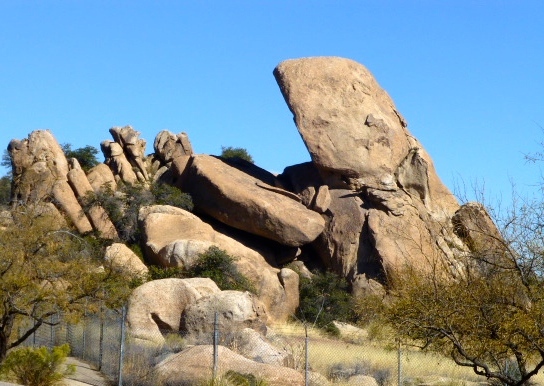 When I travel to Arizona, a must stop is the rest area at Texas Canyon to look at the amazing rock formations. And I do enjoy the chance to display my Texas license plates on Arizona turf. Hassayampa is a Yavapai Indian word meaning River that flows upside down.